BeeHosting Review 2019: Is BeeHosting a Good Hosting? Estonia-based BeeHosting provides website hosting from its server park in Tallinn’s Linxtelecom datacenter. BeeHosting began its journey in 2008, since when it has come a long way to offer cheap, modern and innovative website hosting services to its global clients. 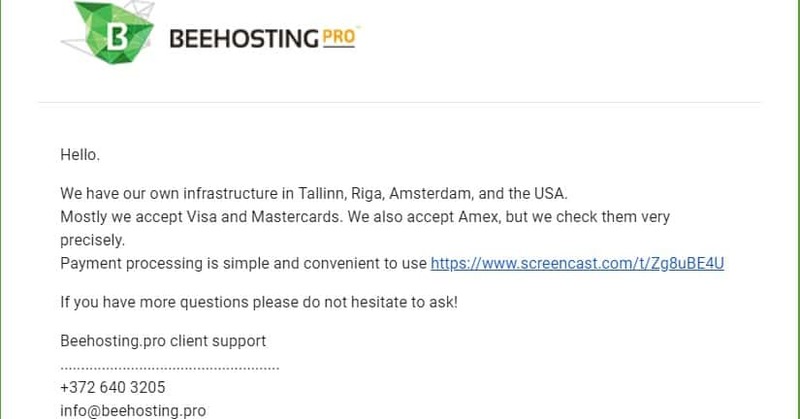 BeeHosting’s server park is in the Linxtelecom datacenter in Tallinn, which is protected by robust security measures, backup power supplies, duplicated precision air conditioners, and dual diverse fiber connections to Helsinki, Stockholm, Moscow, and St. Petersburg. The company also has its own infrastructure in Amsterdam, Riga, and the U.S.
Services include shared and VPS hosting, dedicated hosting, domain name registration, SSL certificates, and SiteLock security. To date, BeeHosting has won 17 awards and has hosted 27,000+ websites. Its own website supports Latvian, English, Estonian, Russian, and Lithuanian languages. BeeHosting offers four shared web hosting plans ranging from the Free plan to Unlimited Pro. As the name suggests, the ‘Free’ plan lets you try the services for free for a month. BeeHosting’s CMS hosting plans come ready with PrestaShop, osCommerce, Magento, Zen Cart, or WooCommerce, so you can easily set up an online shop in minutes. BeeHosting offers 99.9% uptime guarantee. BeeHosting’s shared hosting plans are pretty affordable but beware the 20% VAT element added at the checkout. You can pay for the plans in euros via Visa or Mastercard, PayPal, Danske Bank, SEB, Swedbank, WebMoney, QIWI wallet, or Bitcoin. BeeHosting offers monthly, quarterly, semi-annual, and annual billing cycles, and the 30-day money-back guarantee means you don’t need to worry too much about signing up. For self-support, BeeHosting provides a nice knowledge base and a regularly updated blog. The only potential issue (for me) is that some of the knowledge base articles aren’t in English, but they seem to be perfectly understandable when translated by my browser. For cheap and reliable hosting from a provider with a robust infrastructure backed by competent support, BeeHosting could be your host. Get robust, reliable and affordable hosting from BeeHosting . Wondering how BeeHosting stacks up against other Web Hosting companies? Enter any other Web Hosting company and we will give you a side-by-side comparison.